Zoulah welcomes you to her Bewitchen Kitchen and invites you to take a look at Witchie-Poo's Table. Zoulah wants you to know that she isn't the ONLY witch that resides with the Red Couch Family. 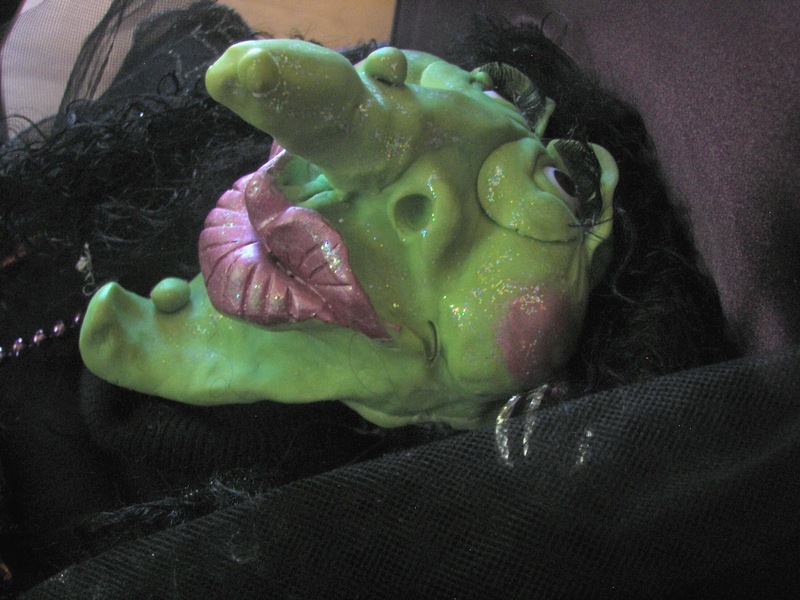 Zoulah would like to introduce you to Witchie-Poo. Witchie-Poo has been in the Red Couch family longer than Zoulah. Talley, the Red Couch daughter, is always anxious for Witchie-Poo to come out of the garage at Halloween. Joni and her sister Jacqueline each made a witch quite a few years ago at a local craft store class. She is quite a grand old dame and taught Zoulah everything she knew in the kitchen before she retired. 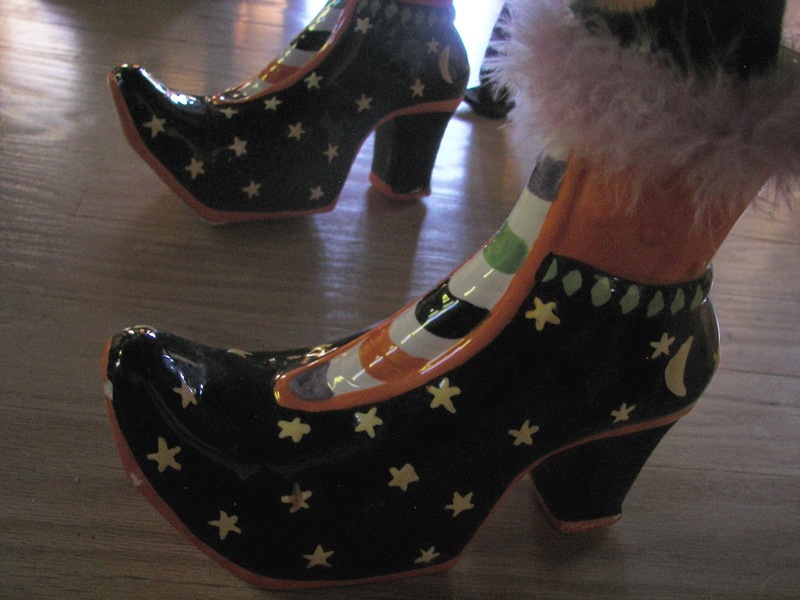 Here are her shoes. She wears orange and black striped tights. A lovely hand, don't you agree? The hands were actually not that hard to make, but it was a different story for the face. Zoulah made some Witch Finger cookies to resemble Withie-Poo's fingers. Let's take the cloche off to get a better view. Now let's really meet Withie-Poo. She is wearing a new Halloween apron. 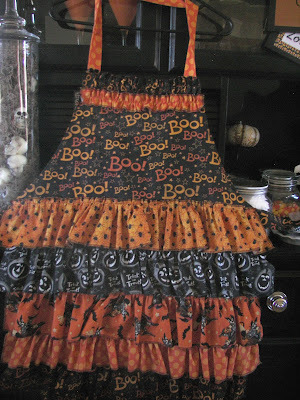 Of course Zoulah cackled with delight when she saw the Halloween aprons that Jacqueline at Purple Chocolat Home had whipped up. 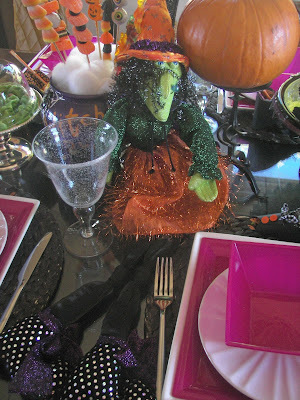 She was a bit green with envy and complained stated that she not only doesn't have a new Halloween apron, but she couldn't enter Jacqueline's giveaway for a new witch hat. 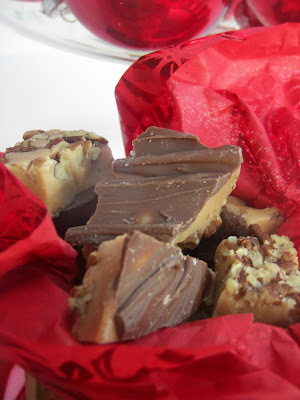 Jaqueline has a soft spot for Zoulah and Beaulah, her twin sister who resides at Purple Chocolat Home, and gifted an apron as a "pseudo-giveaway" -- since she can't win giveaways on Jacqueline's site -- it just wouldn't look right if Joni won. 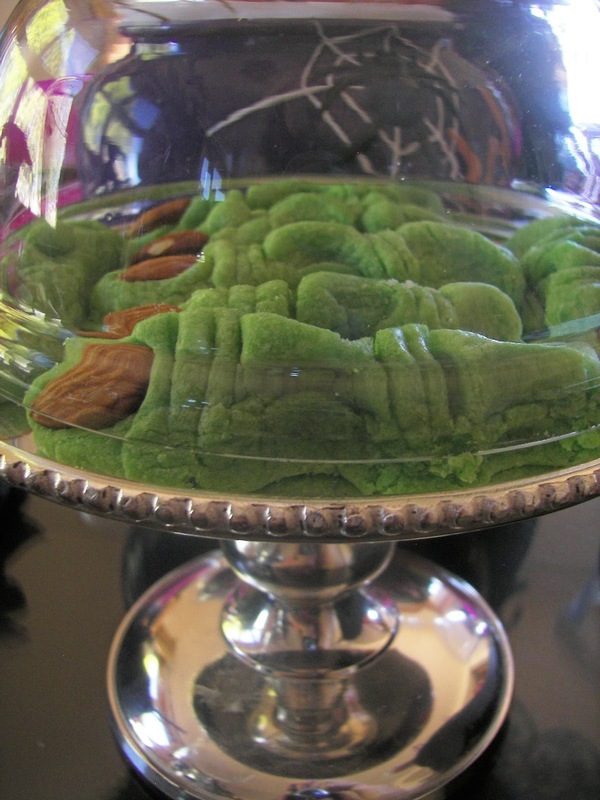 When Zoulah saw the apon, she thought it was for her -- after all who HAS been doing the Halloween cooking and baking in the Red Couch home this season? She tried it on. 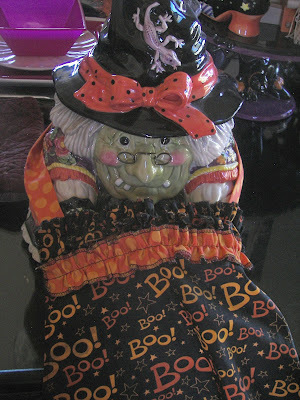 Even Zoulah agreed -- with much regret -- that the apron would fit Witchie-Poo better. Thanks Jacqueline! We all love it -- it is just so Halloween-y! Zoulah would like you to meet Stella, the other green-faced witch residing at the Red Couch Home. The green witches like to stick together. Here's a few other witchie friends. Zoulah thanks you oodles and oodles for stopping by Red Couch Recipes and viewing Witchie-Poo's Table. I love your witches! 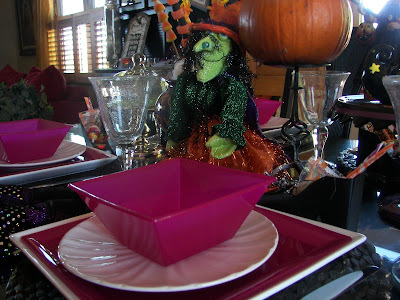 I love the purples and think next year I will have a collection of purple for Halloween! Great table! Those witch fingers are absolutley creepy! The apron is FAB!!! You have a great witch collection going! Just perfect. Love it. The apron is wonderful. I agree, the apron was a little too big on Zoulah, but looked great on Witchie Poo. Maybe we will have to whip up a tiny apron for Zoulah, not that you could see it on her. The table is lovely and the fingers are scary. They turned out really well, looks like the wrinkle remain really worked for the old hags. Love the purple (oh yes, I would!) I loved the comment about the Angelina Jolie lips too. Hope you have a great Halloween. 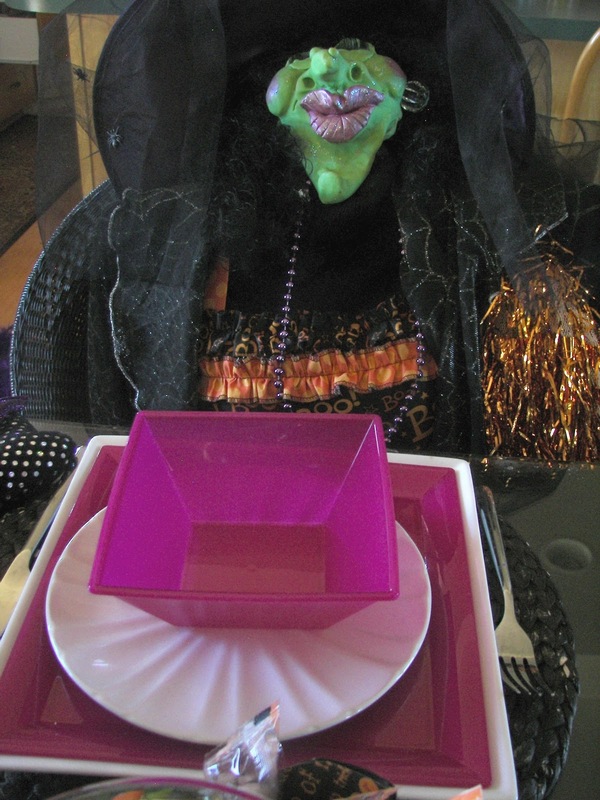 We have two parties to go and then Halloween night and then this old witch is going to sleep for a century. All of Zoulah's efforts have paid off - it's a fantastic table! 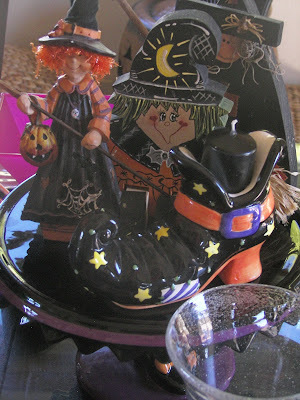 I just LOVE all of your witchy stuff!!! I don't think I've ever enjoyed Halloween or witches as much as I have this year, thanks to Zoulah and Beaulah! :) The apron is darling! I love the apron your sister made. It's terrific! Your witches are awesome, especially Witchy Poo. What detail! I liked those witch finger treats too. 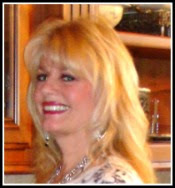 I'm always amazed at the creativity I find in blogland. What a delightful web you weave in your storytelling. I loved my visit. the table was outstanding and those lips on on Witchy Poo, well they are the greatest!! 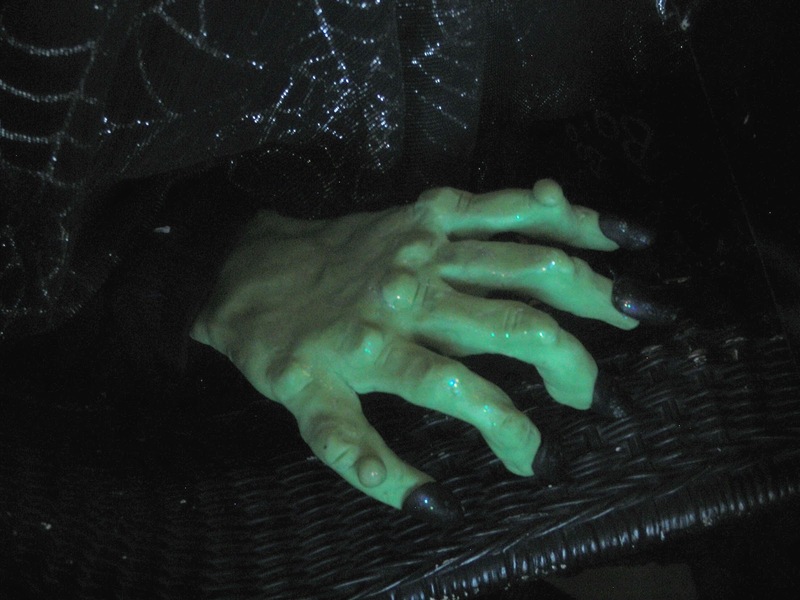 Love those witchy fingers! All your Halloween creativity is such fun. What a fabulous apron! That's a really cute table. I love the green witch fingers. Adorable! Love the witches! Those finger cookies are great. Oh that is loads of fun! Love your witches! The fingers are the realest I have seen. Wonderful colors too! Happy Halloween! 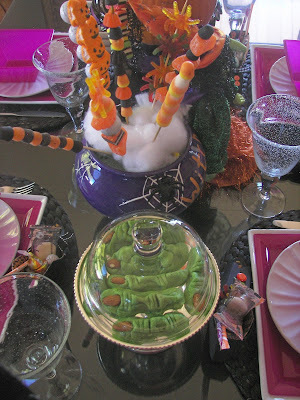 Love the purple and the fingers and oh, the candy kabobs, what a fun treat!!! 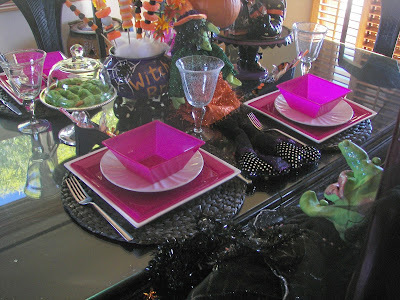 Great tablescape- FUN FUN FUN!!!! What a fun table! You've got some great Halloween things! What a darling Halloween apron! 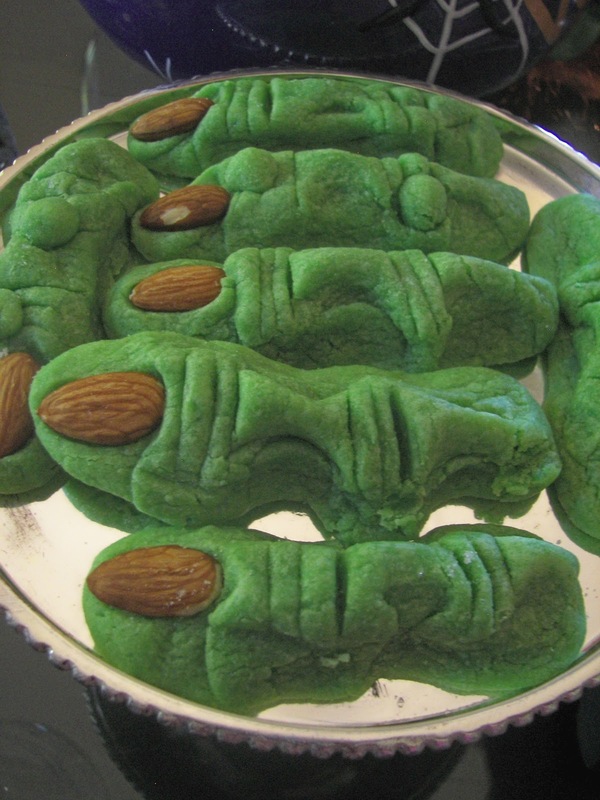 Love the green witchy finger cookies, too! Thanks for visiting my table this week! So wonderfully colorful! And those witches' fingers....incredible! They look fantastic! Have a great Halloween!!! Spooky! 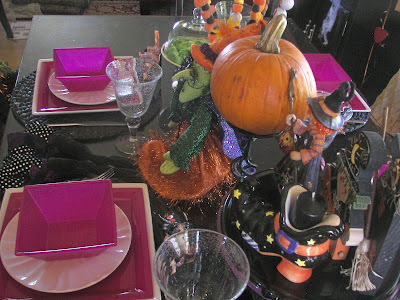 Love the pop of color you have added to this Halloween table. Happy Halloween! What a fun table and I so enjoyed meeting Witchy Poo! Happy Halloween. That apron is sooooo neat! Love, love, love it!